Brewer Description: (from bottle) One day we received an email from the Mikkeller HQ saying that they had an American gentleman coming to Copenhagen. 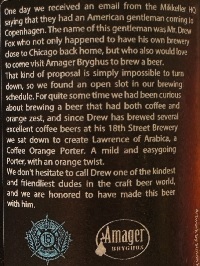 The name of this gentleman was Mr. Drew Fox who not only happened to have his own brewery close to Chicago back home, but who also would love to come visit Amager Bryghus to brew a beer. That kind of proposal is simply impossible to turn down, so we found an open slot in our brewing schedule. 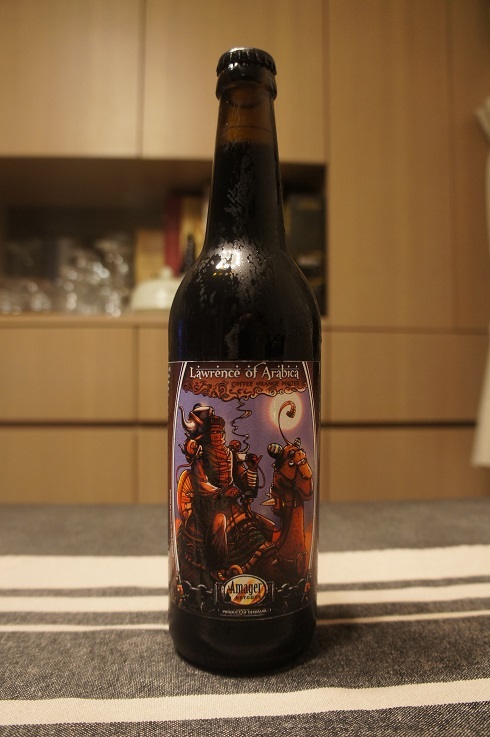 For quite some time we had been curious about brewing a beer that had both coffee and orange zest, and since Drew has brewed several excellent coffee beers at his 18th Street Brewery we sat down to create Lawrence of Arabica, a Coffee Orange Porter. A mild and easygoing Porter, with an orange twist. We don’t hesitate to call Drew one of the kindest and friendliest dudes in the craft beer world, and we are honored to have made this beer with him. Intro: A 500ml bottle, batch no. 1095 with a best before date of July 2018. Poured into a Lost Abbey teku glass. Appearance: Dark dark brown in colour with a one finger mocha head that dissipates quickly and leaves only sparse lacing. Aroma: Coffee, chocolate and dark roasted malts with only subtle hints of orange peel. Taste: Strong bitter coffee, milk chocolate, roasted malts and a light herbal element with only hints of candied orange peel in the background. Overall: Nice and easy drinking Porter with good strong coffee flavours. The orange was perhaps a little light such that I probably would have missed it if it wasn’t written on the label. Still pretty good though.